Authentic Rockabilly Music. Done in the Style of the original rockabilly Cats from the early 1950s! Authentic Rockabilly Music speaks both to the people who grew up in that era and to those with more modern musical tastes; to long-time fans and new converts alike, it readily becomes apparent that the purest form of a genre is often the earliest. 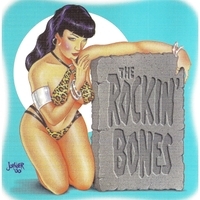 The Rockin' Bones stay true to the original classic rockabilly styles of such artists as Gene Vincent and The Blue Caps, Eddie Cochran, Johnny Burnette and The Rock and Roll Trio, Carl Perkins and early Elvis Presley. The Rockin' Bones do not parody rockabilly heroes; they are not an oldies band; they strive instead to capture the essence of a swinging, beat-crazy music. Each musician in the band has an extensive background and collectively their musical careers span the past twenty years. This group has come together out of their love of roots music and rockabilly. The music The Rockin' Bones play celebrates the origin of rock and roll. This Album of 8 Original Tunes reflects that love for Rockabilly Music!